In 1969, Pat’s junior year, Elder went 8-2, 6-1 in the GCL. In 1970, his senior year, they went 6-3-1, 3-2-1 in the GCL. Pat received All-GCL Honorable Mention and a team award designating him as Best Offensive Lineman. In 1971, Pat received two offers to play at the next level, Notre Dame and Miami University (OH). 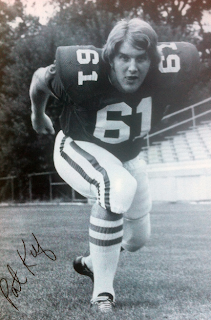 After the Fighting Irish made Pat sweat longer than desired, he decided to play for the team that was foaming at the mouth to get him on the field, the RedSkins (now the RedHawks). 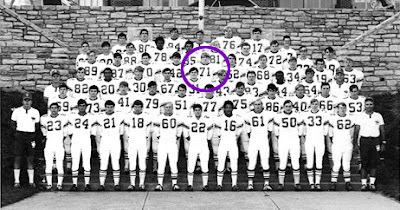 Pat sporting #61, was a 3-year starter for the Mid-American Conference (MAC) team between 1972-1974. In 1972, Pat’s sophomore year, they chalked up a respectable 7-3 record. Although, that was nothing compared to what would happen over the course of the next two years. In 1973, Pat’s junior year, they ended the season with an undefeated 11-0 record, ranked 15th in the nation. They were MAC Champions and on December 22nd, beat Florida in the Tangerine Bowl. In addition to the amazing success of the team, Pat was named All-MAC Second Team. Pat didn't celebrate by staying in Florida after the Tangerine Bowl victory and going to Disney. Sportswriter, David Fuselier said it best in an article about #61. That is exactly what Pat did. He married Chris Sohmer, Derek’s grandmother on January 4th, 1974. Someone else did care, Pat was named All-MAC First Team. That in addition to receiving a team award for Best Offensive Lineman, it was icing on the one-year anniversary wedding cake. Pat was not drafted but did receive letters from The New York Giants, New England Patriots, Dallas Cowboys, BC Lions and Calgary Stampeders requesting that he attend their training camps. At that point, Pat was reluctant to continue his pursuit of playing professionally. Although, after careful consideration, he ended up signing on with the Dallas Cowboys as a free agent. He attended the Cowboys training camp on July 8, 1975. After continuing his battle with various injuries and with his only fan pregnant with their first child (Kelly, Derek’s mother), Pat decided that his football legacy had finally come to an end. When one thing ends, another begins. The path from those new beginnings have led to a road that Derek is now sprinting down. With every long stride he takes, he is continuing the legacy of Kief. "Always give it 100%. Don't hold back. This applies to anything, football and life." Although, not as impressive as 1973 or 1974, 2003 was pretty good. Ben Roethlisberger led the 10th ranked team to a 13-1-0 season, Conference Champions and GMAC Bowl win.